Rad Dad in LA 11/12/11: An Asian-American-Family-Entertainment-Palooza! Today, Saturday, November 12, I have the honor of reading from the new Rad Dad: Dispatches from the Frontiers of Fatherhood anthology at my old neighborhood bookstore, Los Feliz' venerable indie Skylight Books. Please join me, editor Tomás Moniz, and two very special guests, YA/middle grade novelist Lisa Yee and kindie musician Mista Cookie Jar at 5:00 p.m. for an awesome, kid-friendly celebration of family and fatherhood. 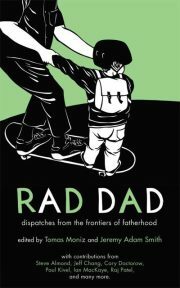 The "rad" in Rad Dad is "radical" as in "politics," not "hipster," and the pieces explore fatherhood as a political act through a myriad of voices. Race, gender, class, sexuality, all are touched on in these pages, and readers of Rice Daddies will be no strangers to these kinds of conversations about parenting. We are so happy to have our special guests joining us at this reading. Lisa is the author of a whole slew of books for young readers featuring Asian American and multiracial characters, including the Bobby Ellis-Chan books, which feature the multiracial protagonist's football-star-turned-Stay-At-Home-Dad. Mista Cookie Jar, a.k.a. C.J. Pizarro, has been wowing kids and their grown-ups with his funky family band, the Chocolate Chips, as well as having his single "The Love Bubble" featured on Sirius XM Kids Place Live and performing at Little Tokyo's Tuesday Night Project. We hope you'll be able to spend your Saturday afternoon/evening with us!